I would like to see part numbers before ordering, Im ordering replacements of worn parts. My son had shoulder surgery yesterday. I have an Aircast cold therapy machine and the tubing that attaches to the machine is a 1 tube fitting. The cuff we have for the shoulder has 2 tubes. Is there an attachment to connect the lines? And can it be purchased in the Sacramento area today? Thanks for any assistance you can offer. It is not available locally it would need to be purchased here. Is the Air Cast Cryogenic Cuff comparable with the Don Joy Coller unit? I have one of these lying around from an old surgery and I was wondering if it can be safely used as a heat therapy pad by filling it with hot tap water. It has not been tested for hot water so we do not know if it will damage any of the parts. What is the medical code for the cryocuff shoulder unit? I need to tell the ins. co. The Cryocuff would most likley be a more conveniant way to ice the shoulder than ice packs becaus the cuff fits over the shoulder and is fill so that the entire surface is cooled. You will also not get any dripping that you get when the ice bag melts. I'm having full thickness rotator cuff repair and bone spurs removed soon. Trying to decide which unit will work best. Will the non motorized unit do the trick? What's the difference? The two units use grivity to fill and empy the cold water into the should cuff, by lifting the cooler 12-15 inches above to fill and placing the cooler on the floor to empy. 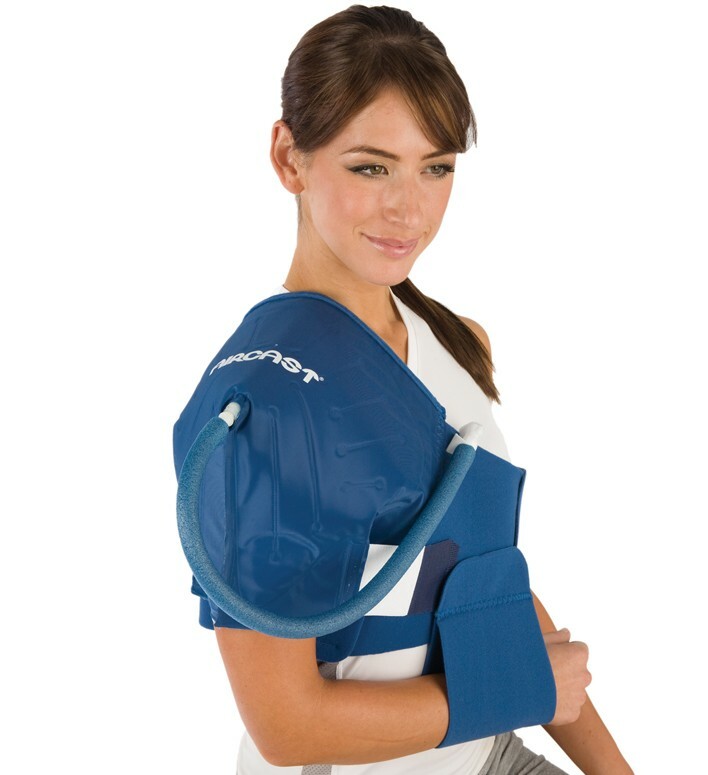 The motorized unit pushes air into cooler which creates internittant compression in your shoulder cuff. so the motorized unit gives you cold therapy and compression where the gravity fed only gives you cold therapy. There is another difference, the motorized unit does stay cold longer before you have to empty the cuff. Thank you for your question. The lid that contains the motor can be purchased in the Replacement Parts section of BetterBraces.com. You would select AirCast Parts and find the lid labeled "AirCast Cryo Cuff IC Lid" https://www.betterbraces.com/aircast-parts-accessories. Does it come in left and right shoulder? This is a universal cuff and can be worn on either the right or left shoulder. Today is my second day home from rotor cuff surgery. Hospital provided this unit upon discharge. I live alone and this unit provided me with the ability to ice my shoulder one handed. Ice lasts almost 24 hrs. Service unit one time and you can ice shoulder every hour. I placed unit on the floor to drain. And then put the unit in the sink, and got down on one knee to fill. The unit is gravity driven. No plugs. No batteries. No fuss. Well worth it! My husband just had shoulder surgery and I purchased this product from his Orthopedic Surgeon. I, too, agree it is rather expensive, but it is worth every penny it costs. Having to ice his shoulder 3 to 4 times a day, I put ice in one time and it stays cold for the entire period of time. I highly recommend this product to anyone who requires frequent cold therapy. I love how you can disconnect it to leave the room without having to carry the entire product around with you. An excellent product and so easy to use and I highly recommend it. I can assure you it has made my life so much easier. I have beer wearing it for 3 weeks since rotator cuff surgery and it has really helped my recovery. Shoulder pain has been minimal and the cuff is easy to use by placing on a shelf over shoulder to fill. Pros: Easy to use, reduces swelling. I recently had a shattered right shoulder/w complete replacement. Within three months of the right replacement my left shoulder started acting up more than normal. The left shoulder had been dislocated several times, thus finally being diagnosed with rotor cuff tears. I finally found this ice system that completely changed my recovery. I was taking three different RX's daily for pain. With this icing system I have reduced that number down to two. I never leave home without this cuff and cooler. Mine is electric and I think it is worth every penny. Great product but have a friend stay to help you lift higher than your shoulder to fill it. The cryo cuff is the best shoulder care product I've found. I was given one after one of my shoulder surgeries 6 years ago. I still use it regularly when my shoulders get inflamed. If you have chronic shoulder pain it's the most reliable item there is. And after the 6 years it still works as well as the first time. Pros: No worries about falling asleep and getting frost bite. Well made and reliable Easy to set up and put on with one arm. Cons: I have to clear my night stand to set it on. There is not enough volume for water in the cuff to make worthwhile the amount of effort required to replenish the cold water supply. My shoulder is injured. The last thing that I need to do is continuously raise, lower, lift, squeeze disassemble, fight with Velcro etc... not only to the cuff but also the added cumbersome cooler. I would never suggest this product to anyone. Also, the advertisement, photographs and information/description of the product was very misleading and vague. Just stick to ice packs. Cons: The product does not work even if one goes through the effort to try to use it. There is just not enough cold water in the cuff at one time to counter the warming from my own body. It was a tremendous comfort for my painful shoulder after surgery. I used it all the time. It was easy and the water in the thermos stayed cold for a long time. I highly recommend it to all that go through surgery or have aches and pain. Pros: Easy to use, lightweight. Easy to refill with new cold water. Has lots of strong velcro straps to hold it in place. Cons: I did not find any cons.